In 2019 we start again with the YOTA Youth Sked, with the main objective of gathering youngsters on the amateur radio bands. We decided to have this radio event every fourth Thursday of each month from 19:00 UTC to 22:00 UTC, and every month there will be a different group of youngsters that will act as a net control. If you and your youngsters team like to hold the next one, please get in touch with us. 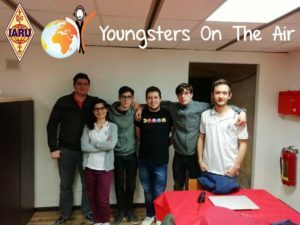 On January 24th, the first YOTA Youth Sked controllers will be a group of Italian youngsters from Verona. They will be active on the bands with the special call IQ5YE (YOTA Event), and there will also be a dedicated web site with a Live-Log where you can also see the activity live. “How to increase the passion of young people in the world of amateur radio”. Everyone (young or not) is invited to take part and interact on the bands and on the web. Remember to turn on the radio on 7.175 kHz +/- qrm and later on 3.675 +/-. Let’s give Youngsters a voice! Follow us, we will give you further details soon!